Use: Leukemia, stomach/digestive tumors . Gleevec is a medication used in cancer patients. It is primarily used to various types of leukemia such as Philadelphia chromosome positivechronic myeloid leukemia (CML). It is also prescribed, however, to treat certain types of tumor in the stomach and digestive system. The active ingredient is imatinib, which is a tyrosine kinase inhibitor. It works by blocking (inhibiting) signals within the leukaemia or cancer cell that make them grow and divide. Blocking the signals makes the cells die. 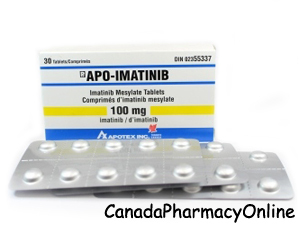 Imatinib is usually taken for as long as patients are benefiting from it. We currently have brand Novartis Gleevec and generic Imatinib (100 mg, 400 mg) available in stock. Call us at 1-866-920-3784 (toll-free) or email us. • Stuffy nose, sinus pain. • Swelling, rapid weight gain, feeling short of breath (even with mild exertion). • If you are receiving chemotherapy. Gleevec is in pregnancy category D (studies have shown high risk to the fetus). You must not use this medication if you are pregnant or breastfeeding. It is safe for use in adults and children over 3 years of age.